The roots of Travis CI are in open source. In that part of the world, communicating via chat, email and tickets is quite natural. When we started grouping as a company two years ago, using these means for communication came quite natural. One of us was in Amsterdam (or in New Zealand, depending on the time of day), the others in Berlin. Still, setting up a Campfire for us to chat in was one of our first steps. As our team grew, we faced some challenges though. What came natural for us at first turned into a core value of our company, and we have to work hard on keeping it like that. Today we have a few people in Berlin/Germany, sometimes working from home, other times working from our little office, one person in Poland, one in North Carolina, one part time in Vienna, another one in Ohio, and that guy in New Zealand, too. I want to share some of the challenges we faces continuing to make this work, both in terms of our tooling and interaction between humans. Most of our team communication evolves around Campfire. We have one common room, the water cooler, if you will, and some separate rooms. One to talk about design-related issues, another one for live support with our customers (The Lounge), another one to handle outages and production incidents (The Panic Room), and a room to discuss operational and administrative issues (The Situation Room). Most importantly, we have a little Hubot sitting there, ready to take commands. We use it for a lot of things, to update our status page during a production incident, to interact with our alerting system, to remind us of certain tasks, even just remind ourselves to remind others of certain tasks. But what it also does is help raise team spirit. You’ll be surprised what a simple pug bomb or even just a Google image search for “fresh pots” can do to get everyone a good laugh. Campfire is our virtual water cooler. Everyone hangs out there most of the time, but people can choose to leave to get work done. It is a distraction, and it’s up to everyone to take a leave when they feel like they need to get work done. There’s an abundance of tools to enable teams to communicate remotely, HipChat, Slack, Grove, and good old IRC, to name a few. Whether you’re chatting via Campfire, discussing a pull request, or sending emails on certain things, communication is always asynchronous. This is quite hard to get used to, and I speak from personal experience. Talking about features, discussing issues gets a bit more casual. For whatever reason they might have, people won’t always be able to immediately respond to a question, to a problem or an animated GIF. A big part of our workflow is going through GitHub issues. Both because our open source is our nature, and because we chose it as the simplest tool that could possibly work. Anything is discussed in GitHub issues. New features, sponsorships, new hires, administrative things, blog posts, outages. There’s an issue for anything. It’s much easier to keep a public and searchable paper trail, accessible by everyone on the team, than to keep all this in personal email boxes. But responses to issues won’t always be immediate. They also have the added downside of adding quite a lot of noise to an email inbox. Remember: a pull request or even an issue thread is best served with an animated GIF. Even working remotely, communicating with people face to face beats all other means of communication. When something needs to be discussed, smaller teams form and discuss things in a small circle. We have one weekly team call, where everyone gets together for some face time, though time zones don’t always permit everyone being on the same call. We currently use Google Hangouts for these purposes, but it’s unfortunately a terrible experience. Friends have recommended alternatives to us, among them Zoom, Blue Jeans, Dozeo and FuzeBox. We’ll try out some of the alternatives and will report back on our findings. Putting 10 different video streams together is no easy feat, but facetime is essential. At last year’s FutureStack conference, GitHub’s Streaming Eagles gave an inspiring talk on supporting remoting workers by bringing them closer to each other. A must watch, if you ask me. I found one thing in particular very interesting. They talked about a video presence system they have in place. Its purpose is to give a live feed of everyone who’s working remotely. They don’t have to talk, they don’t have to look at the feed all the time. But the feed gives your team something quite powerful, it brings your remote workers closer together. The solitude of the home office is converted into a place where you can see your co-workers, talk to them anytime, but there’s no obligation to do anything. Just seeing faces can have a big impact on team happiness. 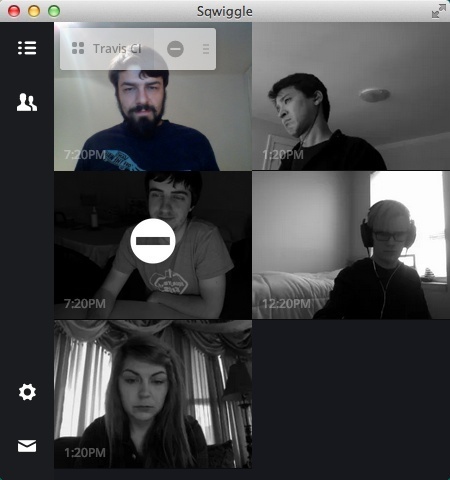 We’ve been trialing Sqwiggle recently, a product that gives you both a feed of everyone on your team, with pictures updating every couple of seconds, and the ability to start a video chat with up to four of your team mates at any time. Here’s a feed of the Travis CI team, hard at work. Which is to say, looking at animated cat GIFs. While we’re on the topic of animated GIFs. They may be silly to some, but they can be an incredibly effective tool to raise team spirit at once. I’m guilty of bombing our Campfire room with GIfs occasionally, and their means of bogging down any CPU with rendering can be an annoyance, but they can give everyone a good laugh. Same for emojis (which Wynn from GitHub recently wrote about), pug bombs and a simple /awwww command in Campfire. With a remote team, you need to invest a lot more to make your team happy, to give them room to bond when they don’t see each other in person for weeks or months, to give them a good laugh every now and then. Tools like Hubot, Campfire, Sqwiggle, and GitHub play an important part in our remote life. We’re constantly working on improving our tool set to make it easier for our team to work together.